Throwing a party means making sure everyone has fun, but that pursuit can quickly get out-of-hand. Before you know it, you're once laid back get-together has received so many RSVPs that it becomes obvious you're throwing the party of the century. With an over-abundance of beer and an inflated guest list, your newly-formed epic reputation must live up to the hype. But for the young (and young at heart), there's an easy solution—turn your party into one giant drinking game! What's better than a bunch of your friends competing for absolutely nothing on a Saturday night? Just remember, be responsible—even light beer packs a punch. And there is zero shame is opting out, substituting beer for water/juice/soda, or watching the hilarity ensue from the sideline. 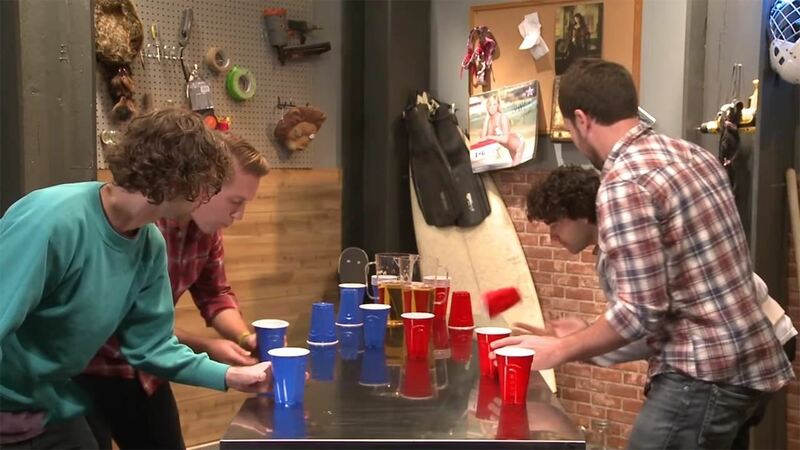 Beer Pong is probably the most well-known drinking game there is. It involves two teams with two players each, a table, 10 cups on each side shaped like a triangle, beer, and ping-pong balls. Put a cup full of water on the side of the table for rinsing in case the ball falls on the floor. 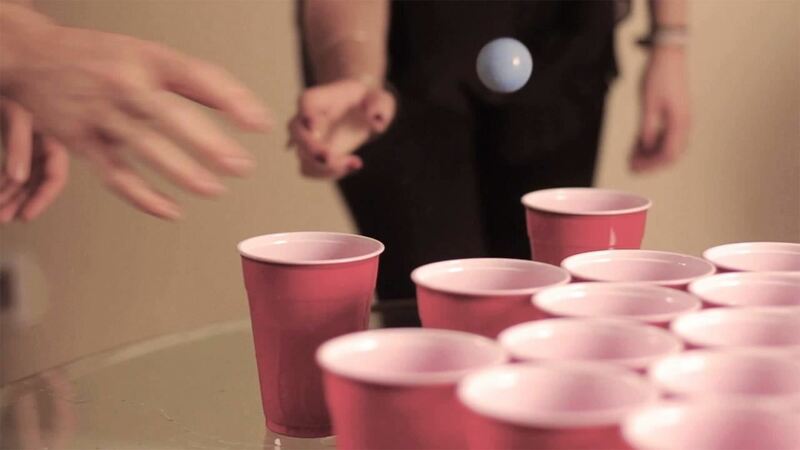 According to BeerPongAUS, the idea behind the game is to land your ball in the other team's cups. If you do, the other team has to drink the contents of the cup, and set the empty cup to the side so that it is out of play. The first team to get all of the cups out of play wins. There are more advanced rules, such as the bounce shot, bonus shot, and redemption rule. However, you and the other players can discuss which rules to use and which ones to throw away, and absolutely create your own. 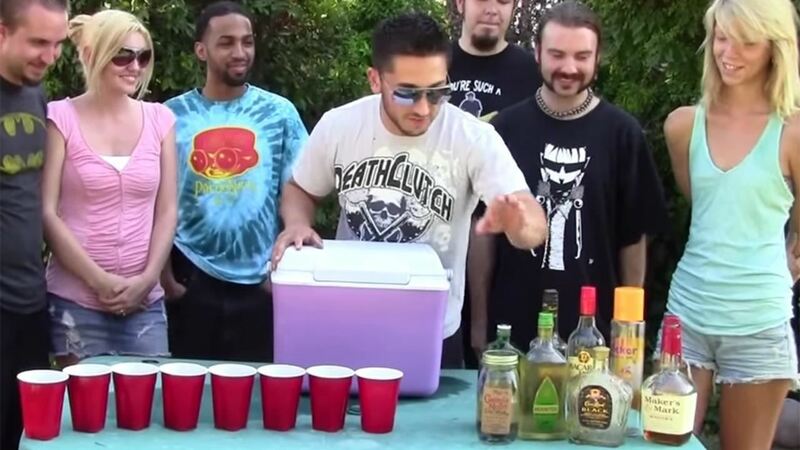 Flip Cup is yet another common and just-plain-fun drinking game, and is great for involving plenty of people at one time. To set up, Mike Capes of Made Man instructs their viewers to have two teams of at least two players, but with an equal amount of participants (otherwise, someone will being pulling double-duty). Set up your cups in a line on each side of your table, with a quarter of the cup filled with beer—or just make sure to "match up" your beer level with the player across from you. The two people on the end of the table start chugging their drink (leads), and when finished, set the cup on the table right-side-up along the edge, then flip the cup upside down with a flick of your hand. Once the cup has been successfully flipped, the player next to the first player can begin chugging and flipping their cup. Each player goes down the line until all the cups are flipped, and the first team to do so wins! Best-of-three or best-of-five rounds are recommended, with the two people next to the initial leads starting off the subsequent rounds. There's a ton of room for customization here, so go nuts. Thumper is an adult version of the game Signs. All you need are 8 people, a table, and of course, alcohol. Videojug suggests that each player make up a signal, then one person starts by flashing their signal, then flashing someone else's signal to pass it on to them. That person repeats the process. If your signal isn't performed, you drum on the table. If you mess up the process in any way, you have to take a drink and start the game over again. Here's a another, more NSFW example from the classic Beerfest movie. Rage Cage is another game that is great for large crowds. With at least 5 people, you can turn any dull get-together into pure chaos. All you need is at least 5 people, 2 ping-pong balls, 10 or more cups, a table, and you guessed it...beer. HowtoPartyPage explains the rules by telling the viewer to form the cups in a circular fashion (like a honeycomb), and to fill up the cups about a third of the way, with the cup in the center filled to the top. Find two people in the group who are on opposite sides of the table to start. The goal is to chug the beer, then bounce the ping-pong ball into the now-empty cup. Once you have done this, pass it on to the next player to the left—the cup keeps getting passed until it reaches someone who is still bouncing the other cup. Once this happens, you stack your cup into the second cup and the player still bouncing passes the stacked cups, drinks from the middle, and starts bouncing the ping-pong into their newly empty cup. The game then repeats itself until all the cups have been consumed. You can substitute the stacking action by slapping the cup away (gets a little messier, but much more rowdy), and the center beer (the full one) with a shot or mixed drink. Justin of Wreckless Eating ends the list with instructions on how to play Shot Roulette. You will need multiple bottles of hard alcohol, cups, and a hat to pull numbers out of. This is a great one of polishing off bottles that don't have much booze in them. Number each cup and put a random shot in it. Have someone pull a number out of a hat. Whatever number you pulled out, you must drink the corresponding cup. Watch your friends squirm as they try to figure out which shot is which. Whether you choose to play one or all of these games, you're guaranteed a good time. Just stack up on beer, red cups, and ping-pong balls and you're all set. Heck, you can even mix and match the things you'll need for these games to make up your own game. As long as alcohol is involved, they will probably go along with it. Just remember to drink responsibly, and share your games or modifications with us in the comment section below.